Okay, okay, stop smelling like beef and cheese, I just discovered that my local cable company is showing it as an On Demand selection. Okay, okay, for $2.99 I’ll watch Elf. Happy? Here’s the thing. I’m not that much of a Will Ferrell movie fan. And Christmas movies tend to bore me – they’re often based on the same recurring feel-good theme that you can see approaching from ten miles away. But since everyone in the whole wide world has seen Elf – well, everyone except me – I figured I could kill a Sunday afternoon watching it. And you know what? I kinda liked it. The first thing I had to take into account was that this film was going to touch on every single Christmas cliche out there – the hard-boiled office worker who doesn’t believe in the holiday season, the whole “believe in Christmas and believe in Santa and everything will work out well” gimmick, and the abilities of Christmas elves to perform magical feats to make the holiday season bright. And I kinda liked the little homages to Christmas specials of the past – the Rankin-Bass stop-motion animated snowman (since Burl Ives is quite dead now, Leon Redbone was a fitting choice as the singing snowman), the idea of giving Gimbels Department Store their own Santa Claus story (yeah, I know Gimbels folded in 1986 and the original Gimbels New York property is now the Manhattan Mall, but work with me on this), and the whole framing story with Bob Newhart as the narrator. Plus, the cast – Lou Grant, Sonny Corleone, that girl… who’s that girl… oh yeah, it’s Jess – all looked like they were having fun with this film. Come on, it’s not a Merchant-Ivory production. It’s a happy little Christmas story. Maybe the most memorable thing for me in this film was Will Ferrell’s character of Buddy the Elf feeling completely out of place. He was out of place as a human among elves, and he was out of place as an elf-raised human among humans. The gifts that he had learned from both worlds might not have suited him in either world. How many of us feel like we’re out of place in our lives, that we’re the puzzle piece in the wrong box? Yep, it was a good film. Sorry I didn’t get around to seeing it when it first came out. I loved it too. I just watched it via Amazon last night! I have no idea how I missed it the first time around! 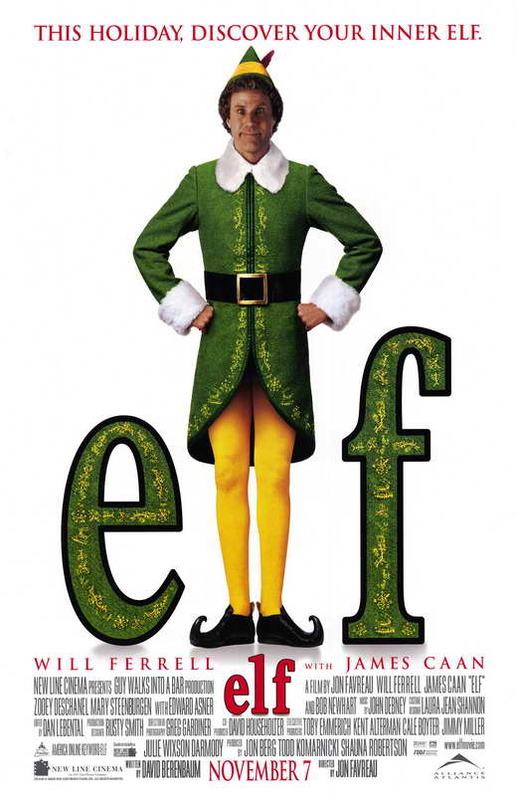 Elf is a funny, feel good movie. My favorite Will Farrell is Blades of Glory.